NOTE: "All-Ink" cosmetic tattoos last for 2-5 days, resist water and are easily removed. Products are made in the USA using FDA approved ingredients. Set of 4 different colored body paints that glow in the dark. Blue, Green, Orange and Yellow. The Black Light Kit Will Have You Glowing! Liquid Latex Fashions is pleased to offer a Black Light Kit that when used in a black light environment, the paint will glow and really show off your creation! This kit includes 6 colors of Liquid Latex Fluorescent Body Paint. Each kit has 4oz jars with the following colors: Fluorescent Red Fluorescent Orange Fluorescent Yellow Fluorescent Blue Fluorescent Green Fluorescent Violet. Each Kit also includes: Our exclusive body prep/clean/finish kit 6 - 1" brushes 1 magic stardust An instructional booklet. * Note: for the fluorescent colors we highly suggest using 2 coats of base coat foundation prior to applying the fluorescent color. This will allow for easier application of the fluorescent body paint and provide a more vibrant color with fewer coats. Open the lid of this beautiful box and behold three generous jars of delicious chocolate body paints. Brush this incredibly rich treat onto someone you love to love, then create a delicious masterpiece on any part of the body. Note: Refrigerate after opening. To reheat: microwave briefly on a low setting or immerse the jar in warm water, if there's any left over! Product Contains: Set contains: 2 oz each of Kama Sutra dark, milk and white chocolate body paints and a body paintbrush to create your masterpiece. Flavor Description: Dark Chocolate, Milk Chocolate and White Chocolate. If artistic design is not your forte, but you still want to enjoy creative sexual fun with body paints, give the My Joy Body Art kit a try! 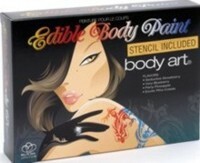 This collection of edible body paints includes a stencil so you can create amazing art without having to focus too much attention on what you're doing, rather lavishing your handiwork on a partner. Once you've created your stenciled masterpiece, slowly lick off the seductive strawberry, very blueberry, party pineapple and exotic pina colada flavors! Brush tip markers. Safe and non-toxic. Create cool body art with six rich colors specially formulated for drawing on skin. Contains only FD&C and D&C approved dyes and ingredients. Tattoo Marks have a smooth brush tip for intricate design. Washes easily from most skin types with a washcloth and soap and warm water. Washable from most clothing. Not recommended for use around eyes. Six colors: black, purple, pink, orange, green, and blue. 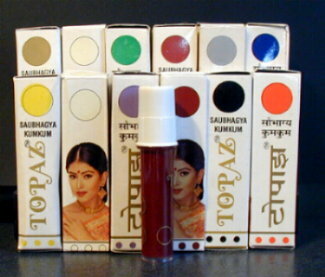 This 12 Color KumKum Body Paint Set is the "Liquid Bindi" used for creating decorations like a Bridal Bindi or some other painted design. This set has a full collection of colors in 5 gm vials and is perfect for festivals or wedding use. All paints wash off easily with soap and water. 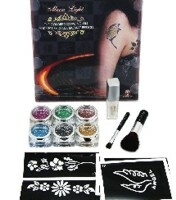 NOTE: Click Image or here to view larger Photo of KumKum Body Paint Set. This 6 Color Body Paint Set includes; Six 3/4 Ounce Bottles of Non-Toxic Body Paint (black, blue, green, red, yellow, & white), Application Brush, Stencils & Designs. NOTE: Paint washes off w/ soap & water. 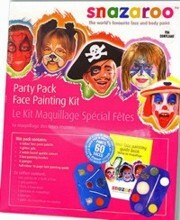 This Snazaroo Face Painting Kit can paint up to 60 faces. A really comprehensive kit containing a paint palette with 2ml Black, White, Red, Bright Yellow, Grass Green and Sky Blue, and a glitter palette with Sparkle Pink, Sparkle Orange and 4 different glitter gel colours, together with 3 brushes, 4 sponges and a 28-page face painting guide. Perfect for children's parties.